This is an image of mine of the legendary vibist Bobby Hutcherson. 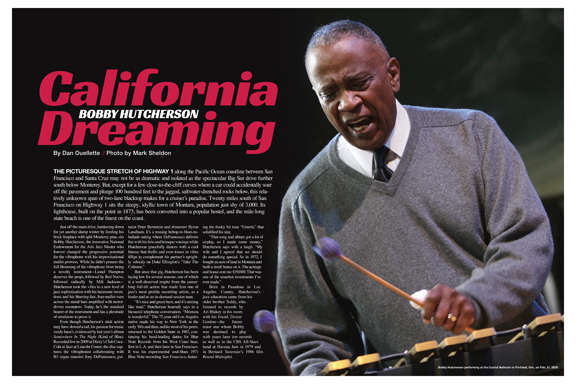 It was used to illustrate a feature on Bobby in the April 2013 issue of Downbeat magazine. I made this image in February 2009 when he appeared at the Portland Jazz Fest. Though now called the Crystal Ballroom, it was originally built as Cotillion Hall, a historic building in Portland. Cotillion Hall was built in 1914 as a ballroom, and dance revivals were held there through the Great Depression. Starting in the 1960s, the hall hosted many popular pop, rock, folk, blues and jazz artists, as well as beat poets and other entertainment. The early to mid 60′s saw James Brown, Marvin Gaye and Ike & Tina Turner play there. In the late 60′s, band such as the Grateful Dead, Blue Cheer and the Electric Prunes performed as well. The building sat vacant from the 70′s though most of the 90′s. The building was bought and re-opened in the late 90′s and has remained so since. One cool feature of the Crystal is the “floating” dance floor on the main floor, which I think is built over ball-bearings. You can literally feel it bounce when you walk on it. I’ve shot in there many times and when the crowd gets going, it’s difficult to shoot in there because the floor moves so much. It’s a beautiful building, if you’re ever in Portland, check it out.